The National Bobblehead Hall of Fame and Museum unveiled a bobblehead of UW Marching Band Director Mike Leckrone on Friday. The newest Mike Leckrone bobblehead plays "On Wisconsin." The 2019 Mike Leckrone bobblehead, left, and American Family's 2003 Leckrone bobblehead will both be on display at the National Bobblehead Hall of Fame and Museum when it opens in Milwaukee later this month. UW-Madison’s beloved Marching Band Director Mike Leckrone, who is retiring at the end of the academic year, has a new bobblehead and this one plays a familiar tune to Badger fans. The National Bobblehead Hall of Fame and Museum released Friday a limited-edition Mike Leckrone bobblehead for $25, $5 of which will be donated to the UW Marching Band. The museum produced 2,019 bobbleheads for sale — a nod to the year Leckrone will retire after a legendary career that began in 1969. He has the longest tenure of any marching band director, past or present, in the history of the Big Ten. 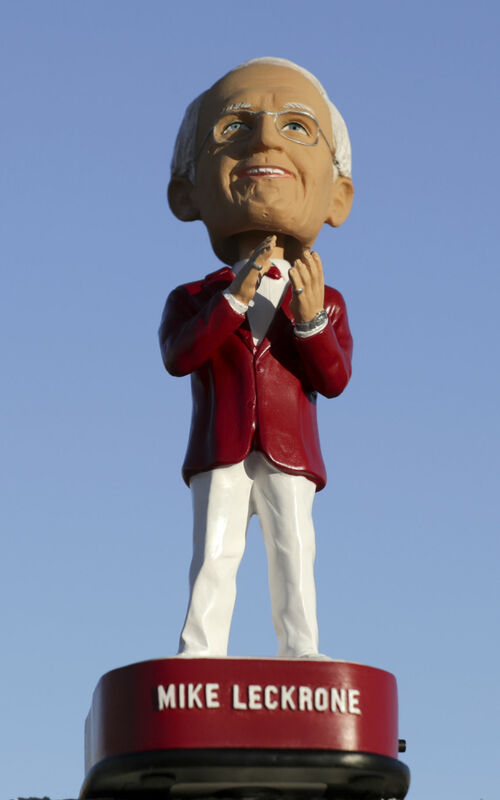 The bobblehead features Leckrone mid-clap in white pants, wire-rimmed glasses, a silver wristwatch, a red suit jacket and rings on both of his pinkie fingers. He stands on top of a base formed in the shape of the band’s logo. Less than 1 percent of bobbleheads feature a musical component, according to museum co-founder and CEO Phil Sklar. 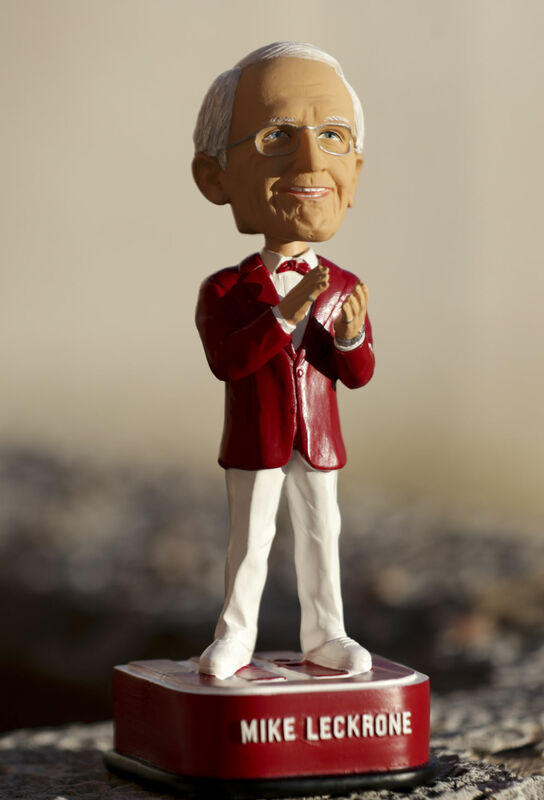 American Family Insurance produced a Leckrone bobblehead in 2003. In 2016, WISC-TV reported that 300 UW-Madison student musicians took their Leckrone bobbleheads on spring break trips, from California to Costa Rica to Niagara Falls, and shared their “Where in the world is Mike Leckrone?” photos on social media. Sklar said Leckrone received his new bobblehead last week and played a role in developing it. Leckrone said he made a few small changes and joked that it was “probably a plus” that the bobblehead did not perfectly resemble him. He said “On Wisconsin” was the most appropriate song choice. “I am pleased and amused by the whole thing,” he said. The bobblehead museum is opening in Milwaukee later this month, at 170C S. First St., and will display both Leckrone bobbleheads along with about 6,500 others from all genres and periods, Sklar said. To order your bobblehead, visit go.madison.com/bobblehead.